The smallest Jerusalem old city neighborhood is the Armenian quarter. 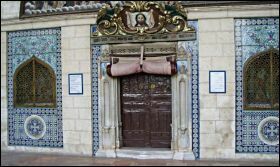 Comprising just one sixth of the Jerusalem old city area, the heart of the Armenian community lies between Jaffa and Zion gates and this is where the world-famous Armenian ceramics of Jerusalem are created. This small quarter is home to one of the oldest Christian communities in the world. The Armenians were the first nation to formally accept Christianity, in 301 C.E. But Armenians were a presence in Jerusalem long before that. The first record of an Armenian visit dates to 96 BCE. After Titus razed Jerusalem in 70 CE and expelled most of the Jews, the Romans imported Armenian merchants and administrators. There are about 500 Armenians living in the Armenian quarter today and most of the neighborhood is owned by the Armenian Patriarchate. The self-contained community revolves around St. James Church and Monastery. The Gulbenkian Library nearby houses one of the world’s largest collections of Armenian manuscripts. If you really want to get to know this Jerusalem old city quarter, it’s best to join a tour group. The Armenian community is very closed and the only places tourists can visit on their own are the church and small museum. Among Jerusalem holy sites, this one is often over looked, which is a shame. The church dates from the 12th century and is said to be the burial place of St. James, Jesus’s brother. The church itself is only open between 3:00 and 3:30 daily. At other times, you can still get into the courtyard of the complex and see the beautiful Armenian ceramics above and around the church doors. On either side of the doors you will see wooden and metal objects called nakos. These date to the 19th century when the Muslim rulers forbade Christians to ring church bells. The monks beat on the nakos like gongs, calling the faithful to prayer. Make sure you are dressed modestly for this visit. A long list of rules is posted at the entrance of the church compound. In addition to the guidelines you'll find on our modest dress page, the fathers won’t let in men wearing shorts, frown on people putting their hands in their pockets and won’t let you sit with your legs crossed. Besides the church and library, the complex also includes a museum, a printing press, an elementary school, a high school, and residential apartments. 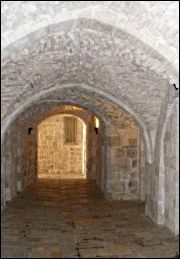 The Armenian quarter is also the source of the world famous Armenian ceramics of Jerusalem. Armenian tile-making took off in Jerusalem in the 19th century, when the Ottomans brought in several families of Armenian tile makers from Turkey to renovate the tile decorations on the Dome of the Rock. The families settled in this Jerusalem old city area and established workshops that continue to produce ceramic goods to this day. 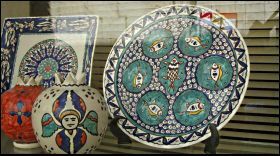 Armenian ceramics adorn every Jerusalem old city neighborhood – namely, all the street signs. Browse around the Armenian quarter and you’ll find several shops and studios of Armenian ceramics. In some places you can even watch the artists at work. You can find Armenian ceramics in most Jerusalem souvenir shops and all over the shuk, but if you buy yours here you can be sure it’s the real thing and not a cheap imitation. Some of the studios specialize in kitchen, bathroom and swimming pool tiles that are just beautiful. Orders come in from around the world. If you are dreaming of a vivid Jerusalem scene on your kitchen wall, or a one-of-a-kind swimming pool, they will ship tiles overseas. 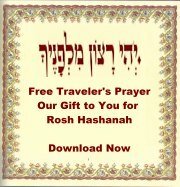 So you can definitely take this unique Jerusalem old city art form home with you.